FQB "Butterfly Garden" Collection takes you to a place of soft tranquility! 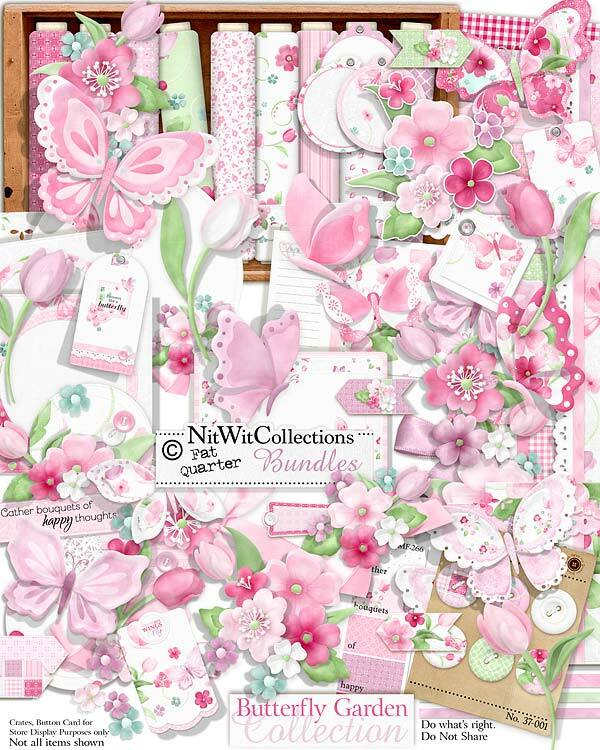 The beautiful colours, the flowers and of course the butterflies of this digital scrapbook and card making kit will be sure to get ideas floating from place to place. We know that the obvious elements will catch your eye but we don't want you to miss the pretty journal cards, the photo mats and the tags that are all so equally graceful and useful! 5 Bows in the coordinated colours of this kit...now to choose just one! 2 Circle mats adorned with a butterfly and one of them also with a floral cluster and bow if you're so in the mood! 2 Flower cluster of different floral varieties all arranged for you! 3 Scalloped ribbons in a "digital" eyelet form...if you will! 1 Tag with a scalloped lower edge - blank to use as you see fit! 1 Tag with a word art phrase attached to the top "Spread your Wings..."
6 Tiny flowers that are created much smaller and different than the other flowers included in this digital kit. The perfect accessory flowers! !